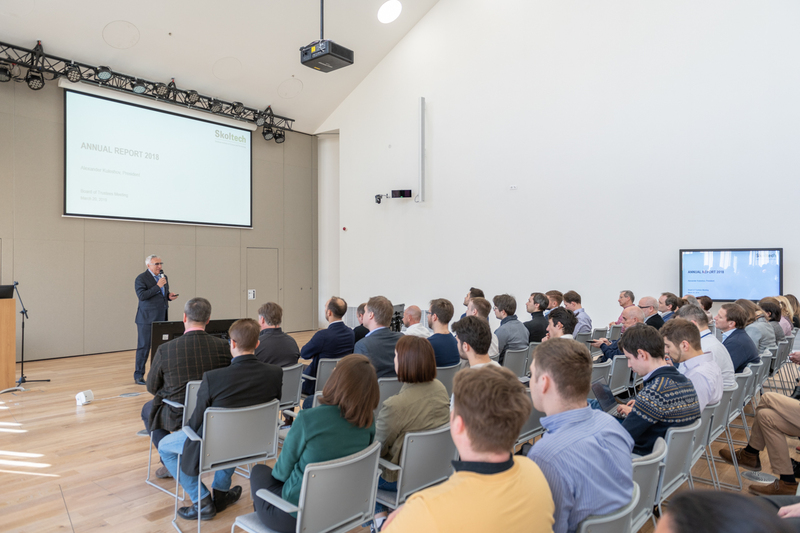 On April 2, the first 2019 “All-hands meeting” took place at the Skoltech new campus. This followed the recent publication of the annual report for 2018. The key features of President Kuleshov’s presentation discussed sustainable growth, academic excellence, the opening of the new campus, and the over-fulfilment of the institute’s goals over the last year; KPIs (Key Performance Indicators) show positive results in most areas. Notable achievements include the fact that Skoltech has co-authored 800 papers over the last three years, giving it a high Skopus Field-weighted citation impact. The Life Sciences PhD program also received HCERES accreditation, the number of projects in Rubles has more than doubled over the last year, and a portfolio on Skoltech’s industrial startups was completed. The President also noted that already 52% of plans for the next three years have been signed. Professor Keith Stevenson followed up by emphasizing that Skoltech must maintain the efficiency and flexibility that it currently exhibits, which is the model of a modern university.